One of the things we'd decided as we were sitting around the fire the night before was that s/j should rent a car so that they could be a bit more independant and since we'd already determined that the six of us weren't going to fit in one car anyway we could use this car over the weekend to transport half of us to aquilla for our safari adventure. As such tagged along with tw when he went to drop of his rental so that we could pick up one of our own. We'd opted for an automatic so js would be able to drive it so despite prebooking a bit of a wait while they brought it over from the airport. Original plan had called for s/j and cj to spend the day exploring Stellenbosch and then for them to head out on their own for an overnight the following day as it would otherwise be a bit of a waste and ra was arriving and would undoubtably be tired from her flight, but cj had spent too much time in the car the day before and his back was bothering him so he decided instead to spend the day and cut with tw. As this meant we really didn't have any commitments for the rest of the day some discussion as to whether s/j might instead take off for two nights. Headed back to the house to pack a bag just in case but thwarted by the fact that they only had keys to the front door and somebody had accidently thrown th deadbolt on that door. Neither tw nor cj answering their phones so headed back to UCT to track them down . Fortunately 11am by the time they made it to campus, coffee time, so sj knew just where to find them. Ran in, grabbed a set of keys to the other door and headed back to the house to sort out clothing. Early afternoon by the time we finally set off. headed in the direction of Stellenbosch. 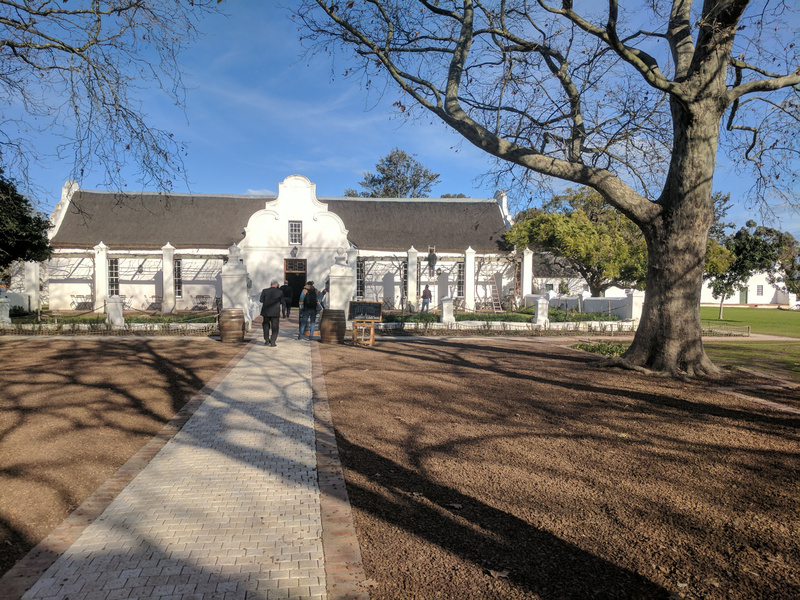 Very strict drink driving rules in South Africa (with a very low limit) so rather than a wine tasting decided just to stop for lunch at one of the wineries. Sj very pleased to find what turned out to be an interesting excellent cheese plate on the menu and had a nice time sitting by a nonsmoking fire and chatting. Poked our heads into the gift shop as we were leaving and ended up buying a couple of very fancy chocolates for bargain basement rates, the exchange rate was definitely working in our favor. After some discussion decided that it might be fun to do a wine tasting after all but that if so we should probably book a room for the night. Poked around online and discovered some very cheap rates for what turned out to be quite a fancy place. Clearly there are advantages to booking a room on a Monday night in the middle of the winter. Checked in, dumped our stuff in our room and headed over to the tasting room just before they closed. Each picked five random wines off the menu and proceeded to sip them while pretending to know something about wine. 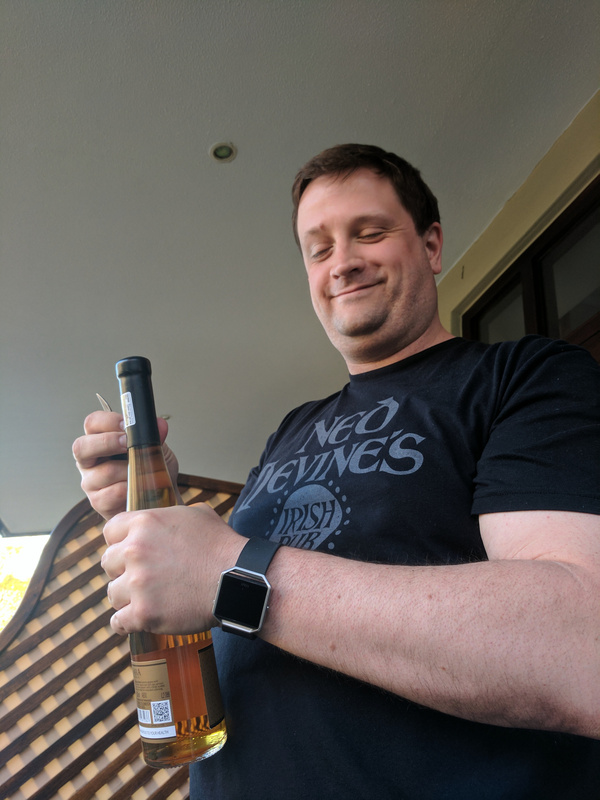 One of them, turned out to be a really nice dessert wine so decided to buy a bottle of that to take back to our room. One of them, turned out to be a really nice dessert wine so decided to buy a bottle of that to take back to our room. 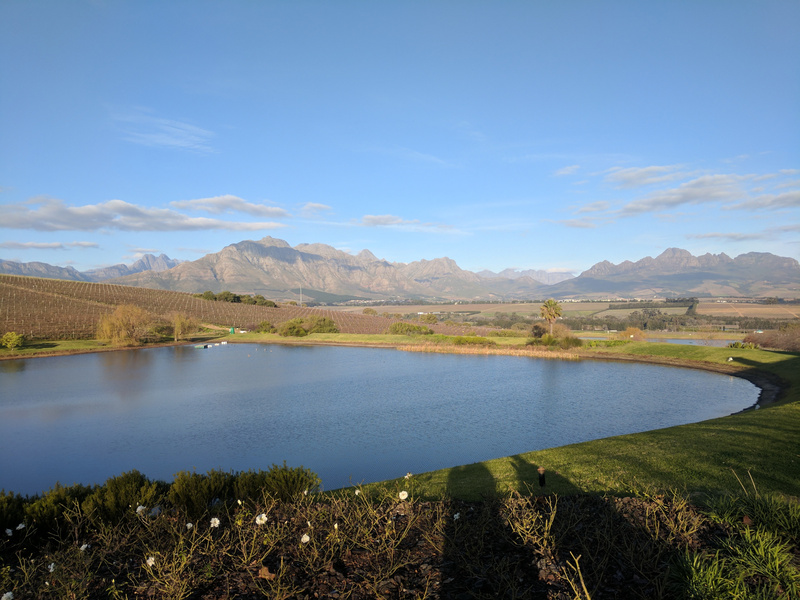 Walked around the estate for a bit, admiring the lovely view over the vineyards to the surrounding mountains. They too had a shop selling fancy chocolates and as they were just as cheap as the others bought three more to go with the wine. Our room had a balcony looking out over the courtyard so headed back there while it was still warm and proceeded to spend the next hour or so relaxing sitting in comfortable deck chairs, drinking wine and chatting. lovely view over the vineyards to the surrounding mountains. We'd actually selected this particular wine estate because it claimed to have a heated pool, alas said pool was only heated in summer so no use to us. The main (fancy) dining room was closed for the winter so made our way to the onsite pub about 8pm for dinner. Ostrich steak for js and another cheese plate for sj. A card detailing the next day's weather had been slipped under the door while we were at dinner. Sj who had paid for the room pleased to see that this one was addressed to miss l instead of mr l as our welcome letter had been. Sj had made the most amazing discovery in the night, apparently the room had radiant heated floors. As a result all she wanted to do was walk from warm spot to warm spot, exclaiming as to how lovely it was but js eventually dragged her off to breakfast. Breakfast consisted of an elaborate buffet featuring all sorts of different items, interestingly despite the fact that it closed in only half an hour we were clearly the first people to take anything from it. Lending credence to our theory that the hotel was almost entirely empty. Indeed we were fairly convinced that it was only us and one other couple, when they arrived for breakfast with 5 minutes to go before the cut off we were sure of it. So much work for just 4 people! 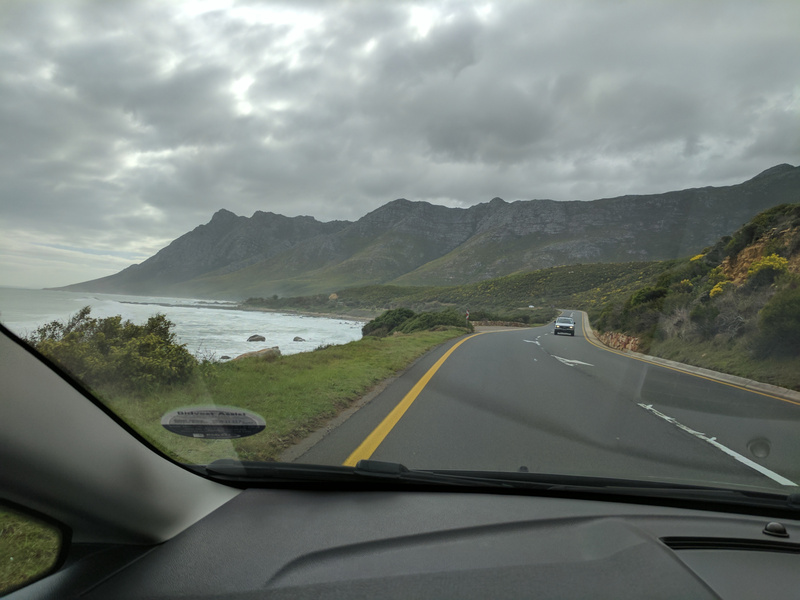 We had spent some time looking at the map the night before so while we were interested in driving through Stellenbosch had decided that rather than heading directly home we'd drive a bit out of the way and drive around Kogelberg nature reserve along the coast road. What we'd failed to account for was the fact that said road was a bit scary, clinging as it did to the side of a cliff. js forced to drive as sj not at all comfortable. Some lovely views so mollified. 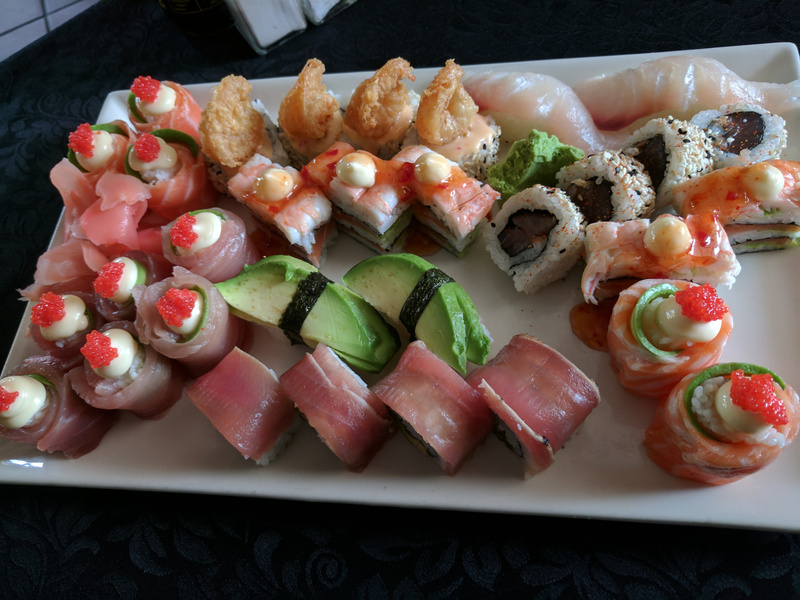 Stopped for lunch (sushi) in Gordon's bay. Stopped for lunch (sushi) in Gordon's bay. Plan called for us to meet up with the rest of the crew the following morning at Slangkop lighthouse in Kommetje so continued on in that general direction albeit we didn't choose the most direct route as sj wanted to visit Llandudno (since that was a town in Wales that she'd spent some time in as a child, and js wanted to drive Chapmans peak drive. Unlike itsWelsh counterpart which is a pretty large town with a promenade along a large sandy beach, this Llandudno turned out to be a small wealthy community clinging to the side of a cliff on the Eastern side of the Cape. It did have a small sandy beach and the landscape around it that dropped suddenly into the sea did look quite a bit like nearby Welsh locations, except for the palm trees of course. Otherwise not much to see other than another wild windy beach. 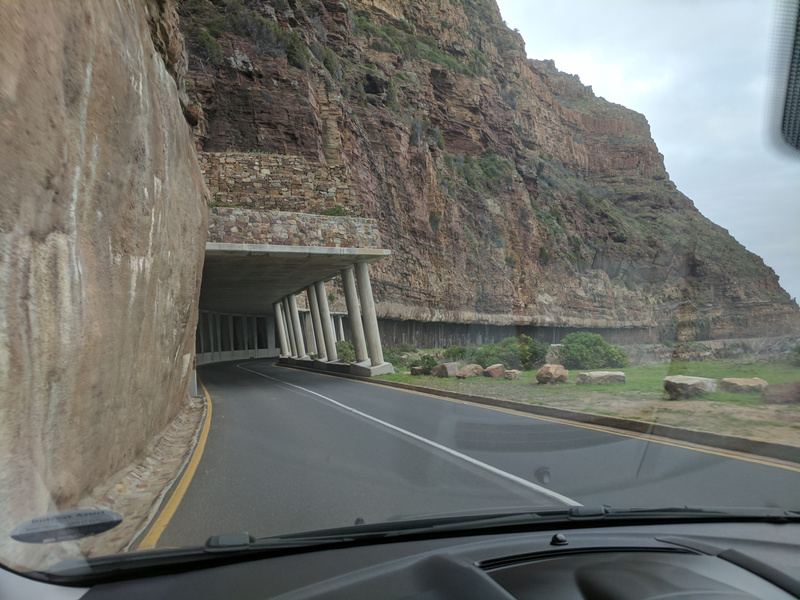 Continued on, paid our toll to drive Chapmans Peak and had some lovely views from the picnic areas that lined the drive. Another scary and windy drive with a shear drop off to the side. A sj very pleased that this time we were on the inside of the road. Apparently the first part of the road could be driven for a small fee and it featured picnic areas with sweeping views of the surrounding countryside and ocean. For a higher fee you could instead drive the whole thing which was what we'd chosen to do. The day trip turn around was clearly marked with an employee there to check our ticket and make sure we'd paid the full fee. 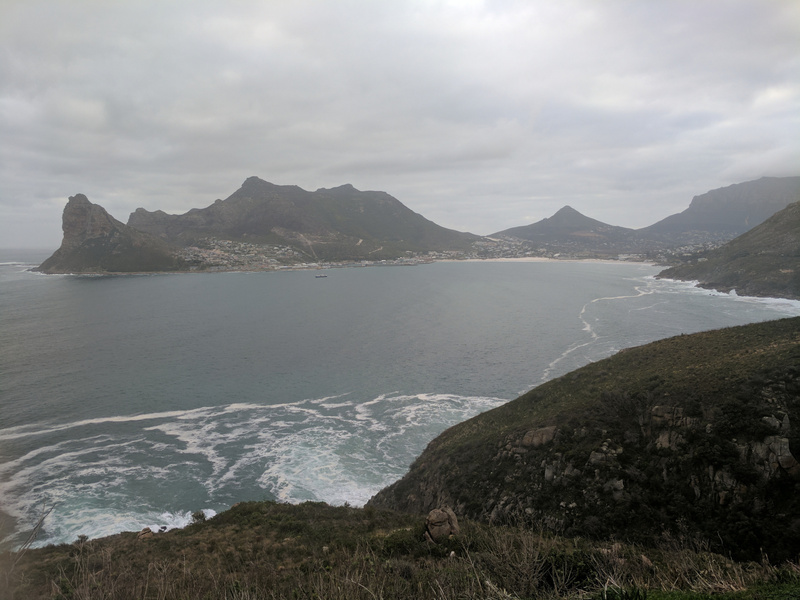 paid our toll to drive Chapmans Peak and had some lovely views across Hout bay. Continuing on the road got scarier, it narrowed and became windier, at the same time the pull offs became less frequent, the verge disappeared almost entirely and the rock wall beside us was lined with nets to fetch falling rocks. 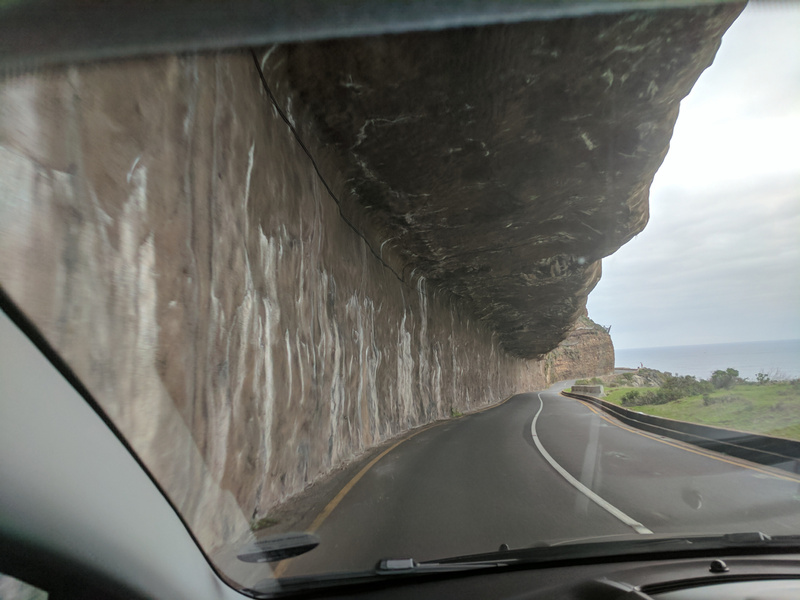 One section of the road featured a covered roadway, the first constructed of concrete columns and the later (Older part) carved out of the cliff itself. Even Js a bit leery about the drive, this mainly due to the fact that he was being tailgated by locals who clearly wanted to go a lot faster. At one corner we were overtaken by a motorcycle doing unbelieveable speeds, both fully expected to pass him later squished against the side of the cliff. Continuing on the road got scarier. One section of the road featured a covered roadway, the first constructed of concrete columns. The later (Older part) carved out of the cliff itself. We'd booked a room at a small bed and breakfast in Simon's town for the night so we headed there next. This time we really were the only guests and the owner upgraded us to a room in the main section of the house as she felt it would be warmer. House was very modern and featured a long living room with a glass wall that could be opened in summer and led out to an infinity pool overlooking the ocean and the mountains on the far side of False Bay. They looked incredibly far away but we knew from our days drive that they were less than two hours away by car. It was gorgeous in the middle of winter and must be incredible in summer when it would be warm enough to swim in it. Similarly our room featured a gigantic bathtub next to a window with ocean views, too bad the current water shortage meant that taking a bath wasn't possible. 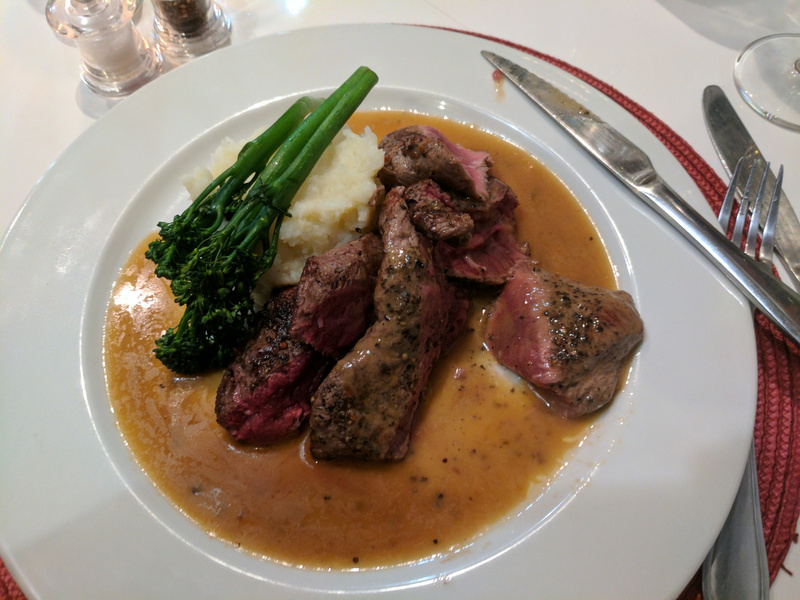 Headed into town and ended up at a small restaurant [Three One Six] that turned out to be phenomenal. 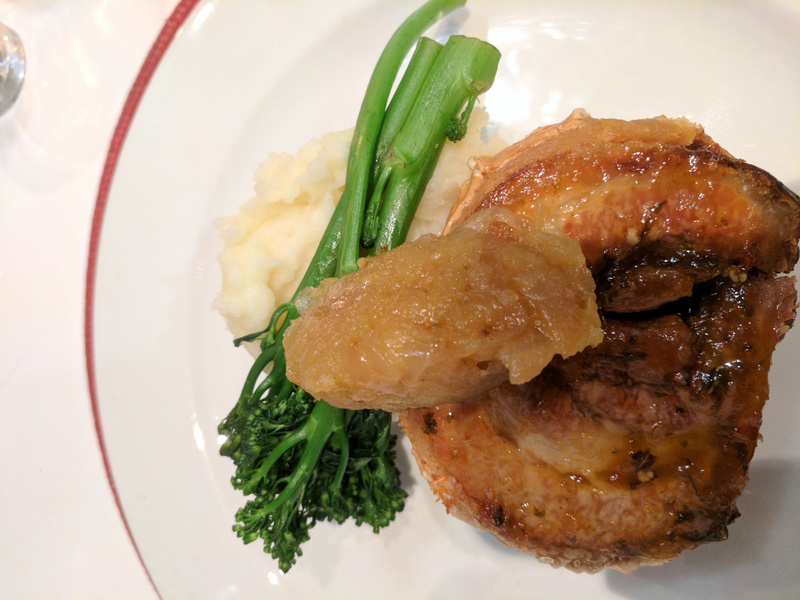 Ostriches steak for js and pork belly for sj. Lots of interesting dessert choices we'd never heard of on the menu so questioned to our waitress as to what each of them were and which she'd recommend. We were both full so decided to split the molva pudding which turned out to be fantastic. After some discussion the waitress arranged to pack up the other two options that we had considered so that we could take them with us to try later. Ostriches steak for js and pork belly for sj. She was a high school student and happy to answer our questions, as the food had been fantastic and she'd arranged for us to take home "salads" sj tipped her well. "Wait what? " she said in obvious shock when she came to run sjs credit card. Apparently nobody had ever left a standard American tip of 20% before, it was all of $9, but it clearly meant a lot to her. Nice that we could use the exchange rate to make someone's day. Back at the hotel we made ourselves comfortable in the outdoor seating area by the side of the pool. A bit chilly but there was a wall on three sides blocking the wind and a pile of blankets. Sampled our extra desserts while we watched the lights in the distance.